Are you a lover of movies and want to play your favourite characters? Now you have the opportunity to have some fun with Star Wars. The Star Wars Saga is one of the biggest movie franchises in the world. Everyone loves the space adventures and popular characters such as Luke Skywalker, Yoda & the Stormtroopers. You can now take the controls of your own spaceship and play your favourite characters on one of our fantastic Star Wars Arcade Machines. Whether it is for a birthday party or a business event, arcade machines are the best way to get everyone socialising and to create some excitement. In fact, they are an amazing way to keep guests entertained for hours! Of course, there is nothing better than playing games of your favourite movies and Star Wars arcade machines are always a hit. It doesn’t matter whether you loved the original movies or are a fan of the new ones, you can play out the big stories with your friends and family. 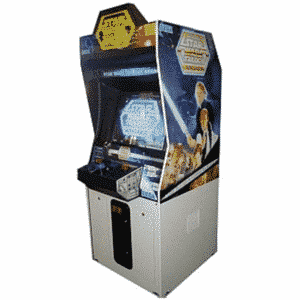 At Arcade Machine Hire, we have one of the largest collections of retro Star Wars arcade machines that you will find. This means you can choose the game that you want the most and have it as a feature at your next party or event. Check them out! One of the most popular Star Wars games that people love is the Star Wars Trilogy Arcade Machine. This game was first released in 1998 but it continues to still be a hit today. Created by Sega, you can take control of the buttons and this is a one player shooting game that will test your aim and shooting skills. You can get lost in the Star Wars world and see your favourite characters and try to find out if you can beat the hire score. This game can be enjoyed by all ages and it doesn’t matter what skill levels you have, this is one that you are going to love! Do you like pinball machines? 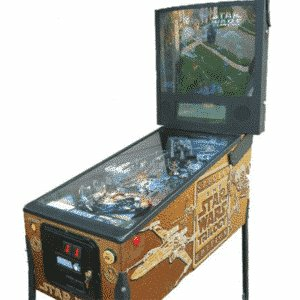 Then you are going to love the Star Wars Trilogy Pinball Machine. This fantastic game was released in 1998 and Star Wars fans have been enjoying it ever since. One player at a time can enjoy this pinball machine, but it is easy for everyone to watch. It was manufactured by Sega, which means you know you are going to have a lot of fun. Put your coins in and see if you can beat the highest score, with audio from the real movies. Of course, this pinball machine also enjoys fantastic Star Wars branding, which means it is going to stand out at a Sci-Fi convention or themed event. Star Wars Arcade Machines are Available to Hire! 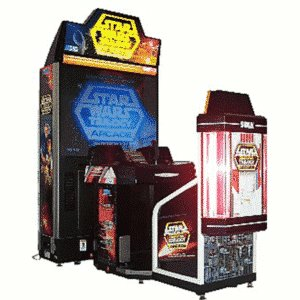 Another amazing choice of entertainment for your party or event is the Star Wars Trilogy Sit Down Arcade Machine. This arcade machine is going to catch everyone’s eye since you can sit down and enjoy everything this exciting game has to offer. It is a one player shooting game that was released in 1998 yet is still offers some of the best gameplay around. It is just like a simulator! All ages can enjoy this arcade machine and it is going to be the talk of the party. So, take control of the joystick and see what score you can achieve in this addictive, fun and one-of-a-kind Star Wars game! So, what are you waiting for? You can choose one of the amazing Star Wars arcade machines we have at Arcade Machine Hire today and make sure that your guests have fun, no matter the occasion!